'Material girl' is of course one of the songs that made Madonna famous in the early Eighties, and also the song that gave her the nickname Material girl. 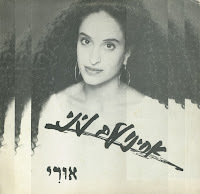 In 1991, Achinoam Nini (known internationally as Noa) and Gil Dor recorded their debut album 'Live', which featured a lot of original songs but also a few cover versions. 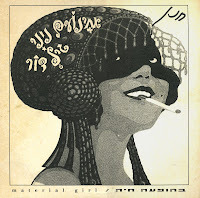 'Material girl' was one of them, and this track in turn was released on a one-sided promotional 12" single in Israel. Through amazing luck, I found a copy in 2000, which was shipped to me from Israel. The record was pressed on very thin vinyl and is bended quite a lot unfortunately. But it's still a unique item to own. And a great cover version, of course! This is a very rare one-sided 12" promo from Israel, which I got to buy through eBay a few years ago. The disc contains an early version of the song 'Uri' as recorded by Achinoam Nini, or Noa as she is better known in the rest of the world. Although this version is very different from the 'Uri' that appeared on her subsequent cd's, when I reported this track to Noa's webmaster at the time, he replied that no earlier version of 'Uri' was ever recorded. Well, I think this is proof enough, don't you? Noa went on to become a big name in the worldwide 'world music' circuit. She's recorded three studio albums in Hebrew and five in English, plus several live albums. More recently, she represented Israel together with Mira Awad during the 2009 Eurovision Song Contest.